No, this truck probably isn’t the truck you want to buy but it really is the truck you need. Looks wise, its about as safe and conservative as you can get on a truck. 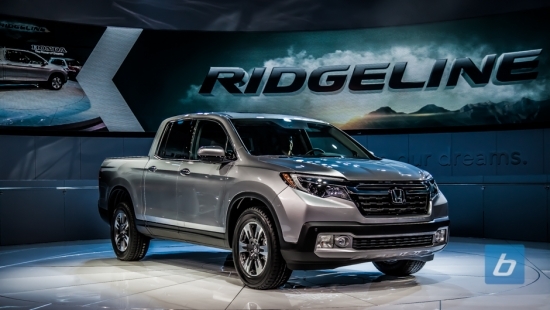 Sure, its gone through a major redesign and looks nothing like the previous Ridgeline but it now looks like a generic truck–not a bad thing though. While it looks much more like a truck, the 2017 Ridgeline is still built on a unibody platform to help save weight. Many truck enthusiasts will argue this is why the Ridgeline is not a real truck but if you’re just taking this to the home depot or best buy this is all you really need. A couple popular features from the last generation Ridgeline have also made it into the newer model, namely the dual-action tailgate and hidden compartment (In Bed Trunk) to store your beverages for tailgating. Speaking of tailgating, Honda demonstrated the impressive 540W 6-speaker sound system built into the bed of the truck. They cranked it up during the unveiling and let me tell you, it was LOUD! The in-bed sound system is standard on the range-topping black edition but is available as an option on the lower trims. As with all new Honda models, Apple CarPlay and Android Auto support is included. The 2017 Ridgeline will be available with a 3.5L V6 (probably a retuned unit from the Pilot) in your choice of FWD or AWD with torque vectoring. If you missed Part 1 of our Outside of SEMA 2014 post go check it out as there are loads of pictures in that gallery. We shot so many that in order not to blow up your internet connection, we split it up into a couple posts. 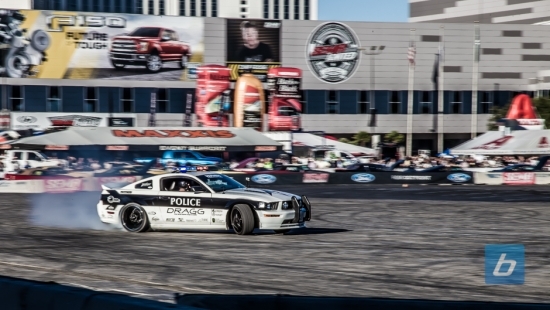 In Part 2 we’ve got more SEMA models, more bikes, more trucks, and some police car drifting action! Check out the gallery after the post, enjoy! You may have already seen our Trucks at SEMA 2014 post, and even our Classic Trucks of SEMA 2014 but if you were an eagle-eyed reader, or an avid fan of Jeeps and other off-road vehicles, you may have noticed a lack of such vehicles. Fear not, as we had to separate them out to make each post a bit more manageable. 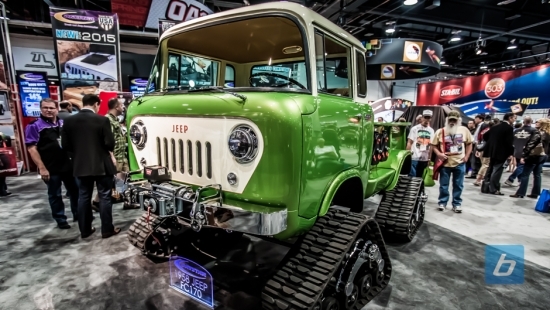 Please enjoy our gallery of Jeeps and other offroad vehicles form the 2014 SEMA Show. I joke every year that the cars and models outside of the main SEMA Show are just as jaw dropping as the cars at most car shows. There is just an amazing amount of nicely done up cars and it really is hard as a tuner to stand out whether you’re booth is inside or outside of SEMA. Instead of just covering the cars inside the main halls we made sure to shoot the cars outside as well and as you can tell there are plenty of great builds. There was a great variety of cars outside including classic trucks, not-so-classic trucks, cars with over fenders, full blown race cars, and cars drifting with show attendees. Yesterday, we posted up our gallery of Trucks at SEMA 2014 and if you took a look you saw there was a huge variety of trucks from almost stock to slammed, carbon fiber laden custom builds. There were so many trucks at the show we shot that we decided to split up the Mater looking classics and rusty trucks and jeeps into their own post. I mentioned to my colleagues as we were shooting all the cars and trucks that of my top 5 list, at least 3 of them are included in this post. That’s right, a wide body Liberty Walk Lamborghini Aventador may really awesome, but nothing beats a classic Ford truck that’s been restored and accented with modern parts. I think my overall favorite was the 1937 Ford Truck built by Smitty Smith at Edelbrock. Not only does the thing rock heated seats, but its pumping out 420 horsepower and 460 lb-ft of torque. 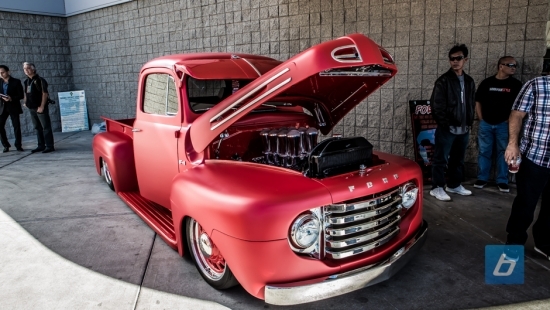 Please enjoy our gallery of old school trucks from the 2014 SEMA Show. Hope you like them as much as I did. I’d never been to SEMA before this year. I’ve been to some big car shows, but this show takes the cake. Think of our little show here in Calgary every March and multiply the size by 10. That is just the inside convention space. There is an entire show happening outside the convention center too. You would think we were in Texas where everything that is bigger is better. Speaking of Texas (land of the pickup truck), we present you with our small selection of the many trucks that were on display at SEMA 2014. We saw everything from relatively stock trucks to heavily modified monsters. You’ll notice fender flares all over the place as that seemed to be the theme of this year’s show. There are slammed duallies and duallies running on rubber bands. 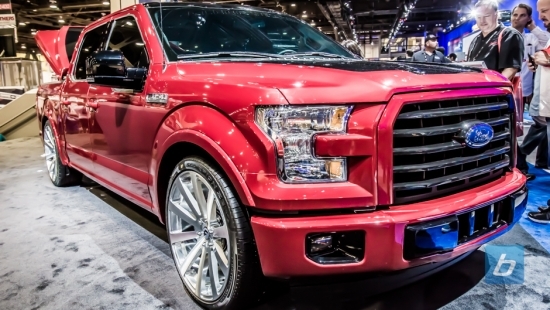 I was impressed with the Ford booth as they brought only 2015 F150s that had been modified. Wonder what that does to the warranty? Interesting note. 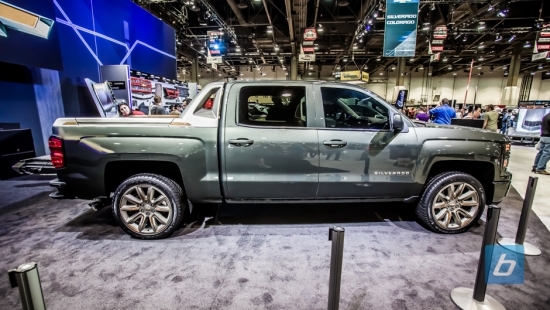 The 2015 Chevrolet Silverado was named Hottest Truck at the 2014 SEMA Show. It was in the Chevy booth. It looks relatively stock. At first glance, I thought it was the new Avalanche because of the bed accessories. As always, enjoy the gallery. Last week Nissan had posted a new pickup truck that had a white cover draped over top of it and said news will be coming out today. 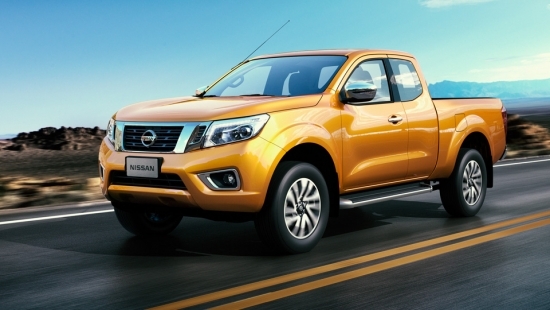 Today, they kept that promise and announced the 12th generation Nissan NP300 Navara (sold as the Frontier outside of Asia). 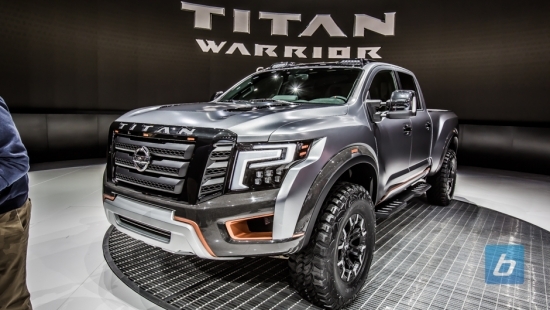 There was a small chance that Nissan was doing a mid-cycle refresh of the Titan but all signs were pointing to a new Frontier debut, the most obvious of which were the roof racks visible under the white cover. The new Frontier gets the updated V-motion front-end design found on all the latest Nissan models and an updated pair of headlights with LED daytime running lights. The front-end updates and the blacked out B-pillar instantly makes the current Frontier look dated. I bet many Frontier owners will be heading to the dealers to put their orders in. The new Frontier will be available in two new colors, Earth Bronze and Savannah Yellow (pictured above). Savannah Yellow looks nice on the Frontier, but looks more like orange to me than yellow. “The Nissan New NP300 Navara sets new benchmarks for performance, toughness, versatility and running costs; all the qualities that are critical for pickup users,” adds Andy Palmer, Nissan’s Chief Planning Officer. Nissan didn’t announce any engine options for the Frontier, but the Navara in Europe will be getting an improved verison of Nissan’s 2.5L turbo diesel good for 188 horsepower and 331 lb-ft of torque. Buyers in Europe and Asia can also opt for a 2.5L inline 4 gas engine if they don’t want the diesel option. Both engines will be paired with a 6-speed manual transmission with an optional 7-speed automatic. The 7-speed automatic provides for low fuel consumption at slow speeds as well as better acceleration, expanded gear ratio for wider range of speeds, and smooth acceleration and shifting. The 6-speed manual features enhanced fuel efficiency from low to high gear, while its optimized shift stroke makes for quick and effortless gear changes. Pictures of the Earth Bronze paint and interior can be found after the break along with a video of the new Frontier in action. If our ever-so-scientific poll on the sidebar means anything, then it looks like the rising gas prices are reaching the point where consumers are changing their habits to adapt. When gas prices in Calgary hit $1.00 per liter, people were still happily buying whatever car they wanted and continued to do road trips. Now, as we hit the $1.30 per liter mark, over half of the poll respondents said that gas prices are affecting their car buying decisions. Perhaps instead of a full size SUV, smaller versions are being sought after–like RAV4s, CRVs, and the upcoming Tiguan from VW. Truck sales in May fell by more than 30% in Canada, a sign that our poll falls in line with the national trend. GM has also announced that four of its plants which produces large trucks and SUVs for the automaker will be shutdown. Its not clear whether Canada’s efforts to increase the production of biofuel will have any effect on gas prices, but one thing is for certain and that is that we need to as a nation and continent reduce our dependence on oil by looking at alternative energy sources. 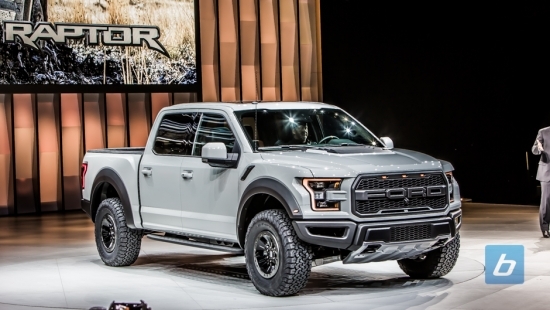 The only good news are those that still plan on buying a truck or SUV (43% of you did say gas prices have no effect on your purchase decision). If you’re in the market for a used truck, SUV, or other gas guzzling vehicle you may want to hold up and wait for prices to fall further as more and more people try to unload them. Check out our used trucks marketplace for the latest deals.